BATTLE CREEK, Mich., Nov. 1, 2018 /PRNewswire/ -- Celebrating the holidays with loved ones and co-workers can lead to never-ending party planning. And between office parties and family gatherings, it can be tough to feed the masses. Whether your party is intimate and relaxed or a more formal affair, Club®, Town House®, Carr's® and Toasteds® crackers are the perfect snack to put on the table. 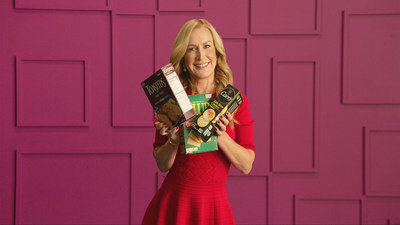 This holiday season, Angela Kinsey, TV party-planning expert and cooking show host, is sharing some of her favorite hosting tips and tricks. In a three-part video series, she'll discuss how to survive and thrive during any holiday party. Angela's got tons of tricks up her sleeve, like this one: Be a Prepper! Keep pantry shelves stocked with crackers like Carr's, you can pair them with cheese and impress unexpected guests, no matter who shows up. Here's another tip you can cook up this winter: Top Don't Shop! If you've got a fridge full of holiday food, top Toasteds crackers with Turkey and Cranberry sauce. Whatever your favorite Thanksgiving leftovers, Toasteds are light and versatile making for tons of tasty possibilities. "I am an avid party planner. I just adore hosting friends and family but sometimes I don't always have time to create meals from scratch. Having crackers in your pantry is so handy. 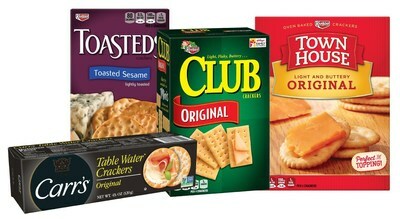 Using crackers to make appetizers is a personal favorite, especially pairing Town House with delicious spreads. It's just so easy and it makes you look way more prepared than you really are! Or, when I have a lot of family I'm hosting flaky, buttery Club Crackers are always a hit. We love them straight out of the box – they're that good!" said Angela Kinsey. Club®: Club crackers are buttery, flaky, melt‐in-your-mouth crowd-pleasers, great on their own or deliciously topped for guests' delight. Town House®: With a variety of options for topping, dipping and munching, Town House crackers are a must for holiday entertaining. Carr's®: Carr's subtle flavor varieties elevate your holidays with the perfect canvas for any cheese pairing or entertaining spread. Toasteds®: Toasted to perfection for a light, crisp texture and signature taste, Toasteds are worthy of any holiday party platter. To watch Angela's content series and hear her tips and tricks during the holidays, follow Keebler on YouTube and Angela on Facebook and Instagram. At Kellogg Company (NYSE: K), we strive to enrich and delight the world through foods and brands that matter. Our beloved brands include Pringles®, Cheez-It®, Keebler®, Special K®, Kellogg's Frosted Flakes®, Pop-Tarts®, Kellogg's Corn Flakes®, Rice Krispies®, Eggo®, Mini-Wheats®, Kashi®, RXBAR® and more. Net sales in 2017 were approximately $13 billion, comprised principally of snacks and convenience foods like cereal and frozen foods. Kellogg brands are beloved in markets around the world. We are also a company with Heart & Soul, committed to creating three billion Better Days by the end of 2025 through our Breakfasts for Better Days global purpose platform. Visit www.KelloggCompany.com or www.OpenforBreakfast.com.